A couple of weeks ago I went on my first family RV trip. My husband had been trying for years to convince me to try an RV instead of a tent; his own family has been going on annual RV excursions since he was eight years old. But, to me, it seemed strange to go camping with what is essentially a mini house (and all its contents) versus what you can carry on your back. How mistaken I was! Don’t get me wrong, I still love traditional camping with my kids – in fact we are off to a campsite in the Sierra Foothills next month – but traveling in an RV with kids can be both an adventure and a blessing. My kids were warm, comfortable, clean and well fed. And, there were no middle-of-the-night trips by flashlight to find an outdoor bathroom. However, just like any trip you take with kids, it is important to be prepared. 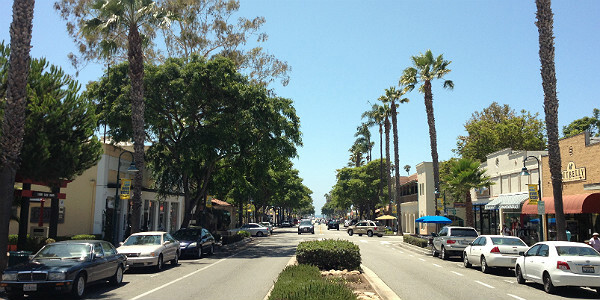 Here are my key tips and tricks, based on my recent vacation in Carpinteria, for anyone looking to rent an RV for their family. RV’s, like most things, come in various shapes and sizes. Pay attention to the rules and requirements of the campground before you book because some have size limits. Also, if at all possible, consider renting an RV that has extra sleeping options. We rented an RV with two queen beds from Cruise America – one in the back and one above the front seats. The plan was to have both our sons sleep on the bed up top and have us use the bed in the back. However when our eldest developed a cough, we decided to take advantage of the small dining area (which also folds down into a twin bed) so as to not disturb his brother. 2. To Hook Up or to Not Hook Up? Frankly, it seems foolish to have all the mod cons – fridge, shower, toilet, lights, air conditioning, heat etc. – and not be able to freely use them. I would therefore always advocate for paying a little extra and renting a site that has hook-ups for your RV. If you aren’t comfortable attaching these hook-ups, ask for some help from your neighbor, or consider renting from a company like 101 RV Rentals in Los Angeles, which will not only deliver your RV to the campsite, but also set everything up for you. One of the biggest perks to having an RV is the fridge and freezer, not to mention the stovetop and microwave. But before you start gathering up enough food to feed an army, be sure you have a good look at the fridge and freezer first. This way you will know exactly what will and won’t fit before you plan your meals. And if you are a condiment fan, buy in small sizes. Even better, pour some from your own fridge at home into the type of travel container you might use to carry shampoo onto an airplane. Also remember to pack a cooler for your beverages. You don’t want your fridge filled with soda cans! Despite calling ahead to get the size of the beds so that we could bring appropriate bedding with us, we still got it wrong. The reality is that the beds on RV’s are often irregular in size which, in turn, means your fitted sheets may not fit. Save yourself hassle and frustration by bringing flat sheets with you instead. Storage bins are great for RV trips because they allow you to organize and compartmentalize, as well as stop things from sliding around when you are on the move. They are also easy to store in the hold or “trunk” of the RV, as well as the overhead cupboards (dependent on size). 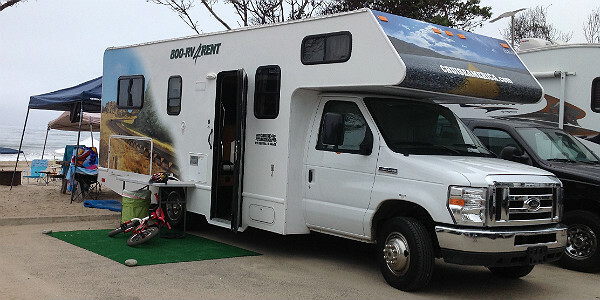 When it comes to clothes though, you may want to check to see if your RV has a little wardrobe – like ours did. If it does, bring some plastic coat hangers with you. Using the wardrobe as an actual wardrobe and not bag storage was extremely helpful. Remember that an RV is not the same as a hotel. You can’t expect to have your bed magically made and the bathroom cleaned each day during your vacation. Those tasks fall to you. And, if you don’t return your RV in the condition you found it, you will be charged a cleaning fee. With that in mind, you are going to want to bring a broom and some basic cleaning products (like Clorox wipes) with you. Also make sure you close your air vents if you are lighting a campfire near to the RV because you will likewise get charged if you bring back the RV smelling of smoke. If you are fortunate to be camping on or near to the beach, you are going to want to have a bucket of water near to your front door to rinse off little sandy feet BEFORE entering the RV. (Having a little floor mat outside the RV, to wipe your feet, isn’t a bad idea either). And, if you have campground showers you may also want to consider using those to bathe your children when they are particularly sandy. (Rinsing sand down an RV shower drain can be a real pain). 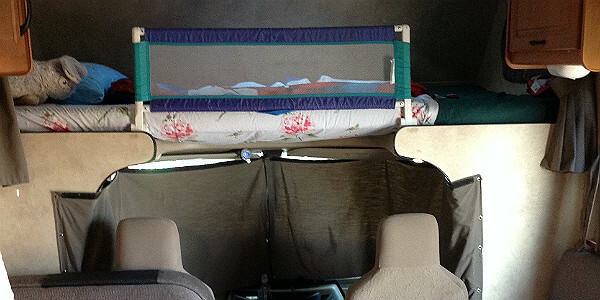 If you are renting an RV where one of the beds is configured above the front seats and you intend to use this area for one or more child, you might want to consider bringing a bed rail with you. There are many different kinds out there. I used a travel version that folds down into a smaller size for packing (see picture), however you can also purchase space saving rails like The Shrunks Inflatable Rail. If your kids are at an age where they like to ride bikes, with or without stabilizers, make sure you leave enough room to pack their bikes. One thing I have discovered camping with kids these last few years is that they love to ride bikes around the campground. But be warned, many rental companies, including Cruise America do not allow you to attach these to the actual RV. Instead they must go in the hold below. But, if you are bringing your child’s bike (and helmet), make sure you also bring a padlock. Bikes often appeal to opportunistic thieves. RV websites like Cruise America do a great job of prepping you for your upcoming trip. A little advance reading can help you understand what you should pack and what to expect. They can also offer extra rental services like vehicle and personal kits. It may seem obvious but, before you book your camp site, make sure there are enough things to do to keep your kids entertained – beyond the obligatory board games that you bring with you. 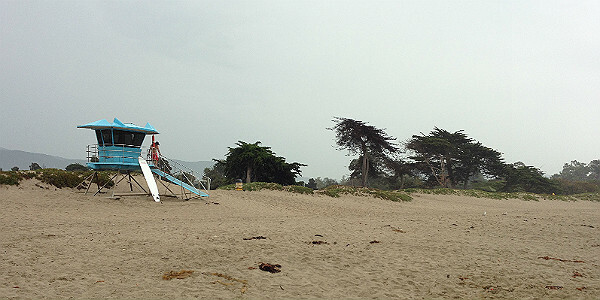 One of the biggest draws for Carpinteria is the State Beach, where kids can swim, boogie board, build sand castles, play beach sports and explore tide pools the moment they step out of their RV. 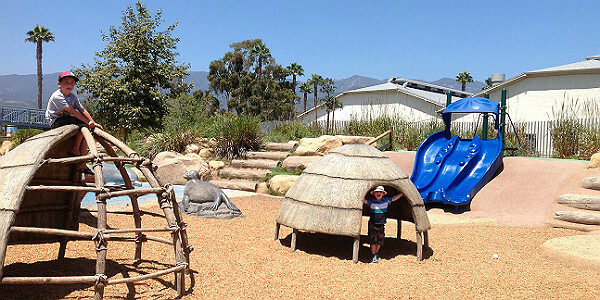 The campground is also within walking distance to shops and restaurants, as well as a couple of great playgrounds. Just booked our first RV trip with the family! Thanks for your tips! Great, great tips!!! Will definitely use a lot of these wonderful suggestions (esp. the water bucket by the door). Makes me want to book a RV for our next trip. Thanks!!! !